a) e.g proteinuria, non-urological hematuria, polycystic kidney disease, horseshoe kidney, etc. contribute to CKD, particularly if requiring inpatient dialysis. Recent evidence suggests pediatric kidney disease may also be associated with adult ESKD. 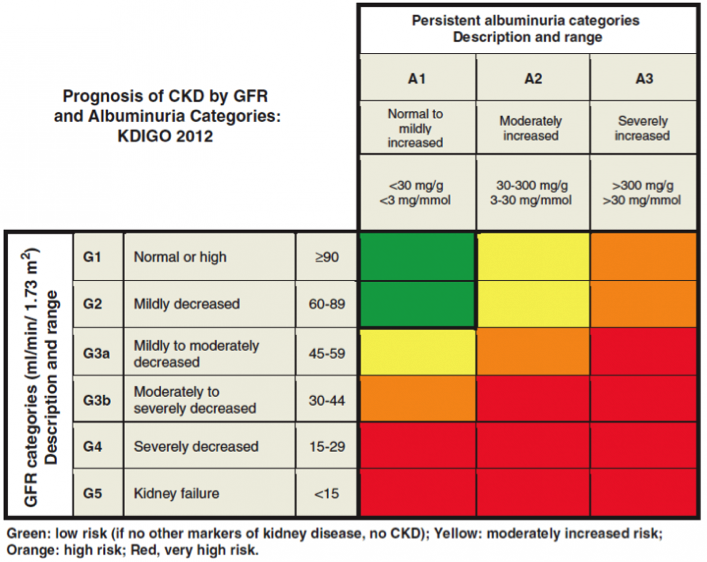 Staging CKD is most frequently done by calculating the estimated glomerular function rate (eGFR) as a proxy for kidney function. These calculations are often based on a patient’s serum creatinine (a muscle metabolite that is filtered in the kidney). Of the three most common calculators (CKD-EPI, MDRD, Cockroft-Gault equation), the CKD-EPI is the most accurate at predicting mortality and ESKD and generally is what is recommended for use. (of note- many dose adjustment for drugs still use Cockroft-Gault- look carefully at this when looking at dose adjustments). 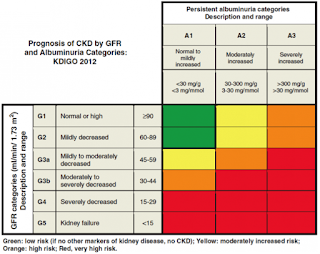 After calculating the eGFR, CKD can be staged into 1 of 5 stages. 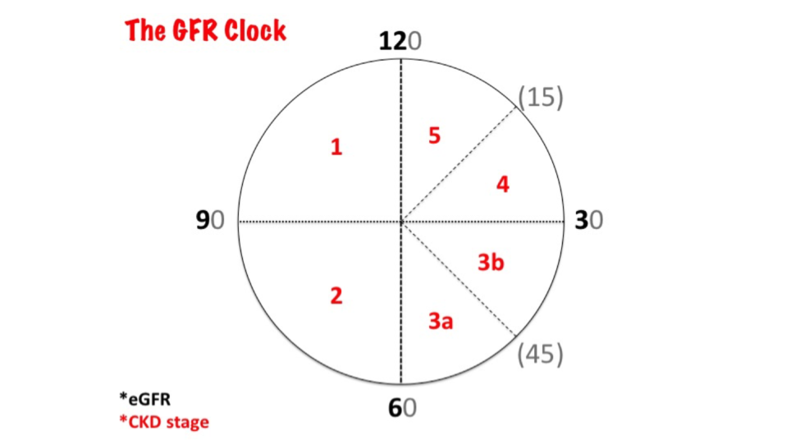 Using the GFR clock is one way to remember the eGFR cut-offs for each CKD stage. Because the above calculators rely on creatinine (which can vary in patients with extreme muscle mass e.g. sarcopenic patients such as the frail elderly or sarco-full patients such as body-builders), creatinine clearance can also be estimated and used to stage CKD. 24-hour urine creatinine clearance equation works for all patients regardless of size. Creatinine clearance is based on the ratio of urine creatinine and plasma creatinine. Cystatin C is another biomarker that can be used for estimated eGFR. Like creatinine clearance, it is mostly useful in patients where creatinine is a bad estimate, though may also help provide more accurate kidney function estimates when combined with above calculations. TheeGFR and proteinuria offers a general prognosis as demonstrated in the Heat Map. a lower eGFR has an observed association with the risk of death, cardiovascular events, and hospitalization. test for multiple myeloma. Free serum light chains. 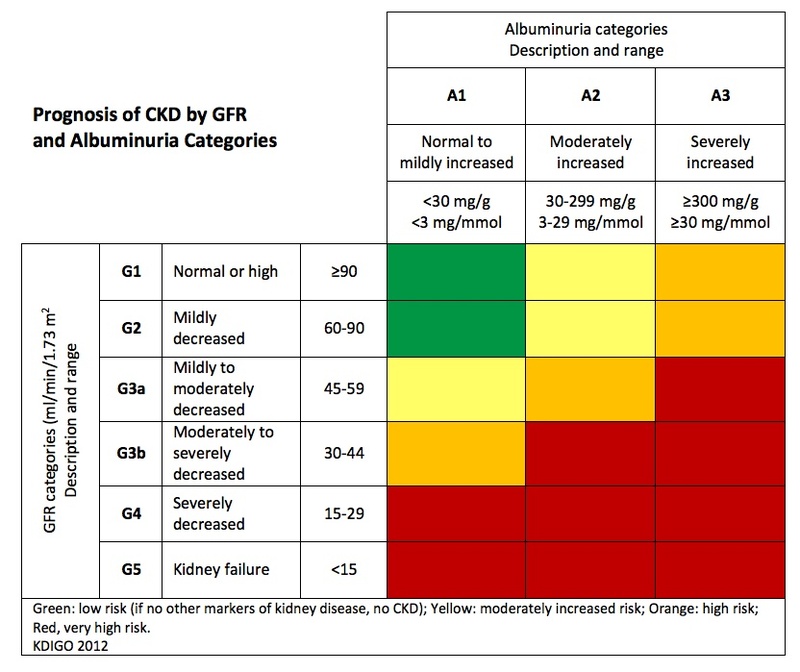 recommended if proteinuria greater than 3g / 24 hr, evidence of glomerulonephritis (hematuria, proteinuria, and hypertension), an eGFR decline of 50% within 1 year. General management should also prioritize treatment of the underlying condition (e.g. hypertension and diabetes) to reverse the progression of CKD. ACE-inhibitors demonstrate a significant reduction in progression of CKD and reduction in proteinuria per the RENAAL, IDNT, and other trials. Fewer patients had progression to ESKD though a mortality benefit was not observed. unclear what would happen if the patients with bumps were not on ACE-I, so this is not an indication to necessarily discontinue therapy). Per KDOQI 2012 guidelines, target blood pressure in CKD is less than 130 over 80 mm Hg. With ACE-inhibitors being the first line drug. Metformin: if eGFR 30-45 and already on metformin (and this is not AKI) can continue metformin. 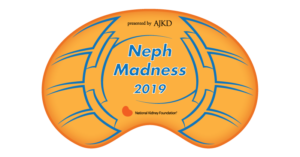 Do not start NEW if eGFR is 30-45, but ok if higher than 45.
worsening nephropathy, progression to macroalbuminuria, initiation of renal replacement therapy and mortality. (EMPA-Reg, EMPA-Reg ESRD + CANVAS). However, studies demonstrating their effectiveness in CKD are ongoing. hyperparathyroidism. The screening labs are a PTH, phosphorus, calcium and vitamin D level. Further information can be found at the KDIGO guidelines on BMD. Depression affects approximately 20% of all patients with CKD. deficiency. KDIGO recommends intravenous iron for anemic, nondialysis, patients with CKD with transferrin saturation link here. Guidelines remain controversial but a full discussion can be found at the AKJD Blog or in the recent NEJM Review. 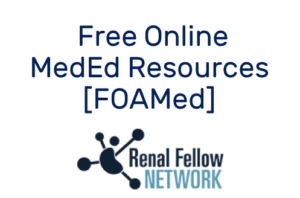 Baclofen– should be avoided in ESKD or eGFR less than 30 and dose reduced with eGFR between 30-6o. Certain medications, such as gabapentin, also will require adjustment for dosing based on kidney function. Contrast-induced kidney injury (CIN) may be overestimated in literature. The AMACING trial shows that pre-hydration does not reduce kidney injury in those exposed to contrast. elevation in serum creatinine with consistent NSAID use. However, the PRECISION Trial showed only ~1% risk of kidney events in CKD patients with daily high-dose NSAIDs. For a more succinct review of the above, check out the new ClinicWiki page on Chronic Kidney Disease.